Interview questions for employers: What you should be asking!! “Find one person younger than you were when you started, and offer them non-monetary support to help them find success.” I love this #ChallengeRichard that came in via Twitter. It epitomises the spirit of business and my belief that you’re never too young to be an entrepreneur. I recently received the wonderful letter below from nine-year-old Annie Spicer-Jones of Kent. Accompanying her letter, Annie sent me some designs of an aircraft that she invented. I thought I’d address the #ChallengeRichard by replying to Annie with some tips to help her succeed in achieving her dreams. Thank you for your letter, your creativity is inspiring. I enjoy talking to young people about their dreams. Too often children are told that they cannot do this, and they shouldn’t do that – but that just restricts their imagination. Don’t ever let anyone prevent you from dreaming. Imagination is one of our greatest gifts. Without it we would never make the changes that make the world a better place. We had a little message today to say we were one of Liverpool’s best recruitment agency. Glad other people think so too! This week we are celebrating Stephanie’s 21 years working for Acs Recruitment this week what a massive achievement! We currently have a number of excellent Legal Secretaries on our books covering all areas of law. January is a busy month for all, even more so for recruiters!! We appreciate the time and effort to all candidates that have applied for our vacancies over Christmas and in the New Year. We normally do try to contact all candidates within 2 working days of an applicable being made, however, we have been inundated with CV’s and would appreciate if you would bear with us whist we contact you all as it is taking longer than expected. Again, Thank you and we will try our hardest to contact you as quick as possible- Happy New Year! W/C 22/12/14 we need your hours in by 12pm Tuesday 23rd. If you are working Christmas Eve, you need to include these hours on this time-sheet (in advance). If you have followed the correct submission dates, all Candidates will be paid on Christmas Eve! The office will close for Christmas Tuesday 23rd and reopen Monday 29th. We will then close again 30th and resume business on Friday 2nd. However, Steph and Gabriella will have access to emails, if you have any urgent enquires. This year ACS Recruitment decided to participate in Christmas Jumper Day 2014 in aid of Save the Children. W/C 15/12/14 you need to have your time-sheet at the latest 11am on Monday 22/12/14. Note to all job seekers! There is a misconception that employers stop recruiting over Christmas period and leave it till the New Year- this is completely untrue. Many of our clients keep recruiting right through the holiday season. You may well be winding down for the Christmas break, but this makes it a great opportunity for recruitment. You will perhaps have a little more available time in which to focus on the recruitment process, and less day-to-day pressure means it’s an ideal time to ease yourself into the business and be trained in readiness to hit the ground running in January. Job seekers also maybe put off if they have no more annual leave left- but no need to worry, as office business tends to slow down during the festive period! Potential employers are more willing to interview out of hours if candidates are looking to start now or in the New Year. So! If you are currently thinking about looking for that new opportunity, email a copy of your CV and one of our consultants would be more than happy to assist you find that right role, and help you start your New Year with fresh new start. On Sunday 23rd November we helped celebrate the crowning of Strictly Ballroom 2014 – Sharon Hennessey and her dance partner Linus at the new Titanic Hotel. All contestants had only 10 hours of dance training, which is fantastic as all participants had never danced before. Not only where we all digging deep in our pockets donating for this worthy cause, we where also watching ‘our’ former 2013 Strictly Ballroom champion –Gabriella, participating as a judge. The whole production was a fantastic success and all of the ACS girls had a fantastic night. Unfortunately Liverpool has the highest mortality rate for lung cancer in the UK. It is still widely perceived that Lung Cancer is a self inflicted disease, which is not always the case. Charities and the NHS are seeing a rise in children as young as 10 being diagnosed with lung cancer, from passive smoking. The 14th November was officially the start of the ACS’s run up to Christmas events. We joined Kirwans Solicitors at Leasowe Castle to help raise funds for their first Ball/event to help raise funds for Claire House Children’s hospice, a charity which they have supported for many years. 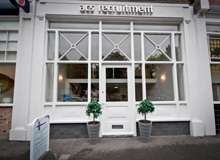 ACS Recruitment has worked with Kirwans for a number of years, and can proudly say that half of their staff we have placed at such a brilliant company. It was also great opportunities not only help raise money but to meet/see some of our old candidates, we placed many years ago. So far total amount raised was a brilliant £3,400! which is a fantastic amount considering this was their first event/ball! Claire Louise Cain is the little girl behind ‘Claire’s House’. In 1987 Claire became seriously ill, and within a matter of a few weeks, their lives where turned upside down. After several weeks of intense investigations, Claire was diagnosed as having a malignant tumour. After a number of brave sessions of chemotherapy and radiotherapy, Claire unfortunately was taken in July 1989, a couple of weeks after her 10th Birthday. After a brilliant week of placement’s and ACS Recruitment securing a fantastic opportunity to work with one of the countries leading law firms, we decided to treat ourselves with afternoon tea at the beautiful 60 Hope Street. Not only do ACS help the general public with helping them secure positions in the legal world, we are also a charitable bunch.